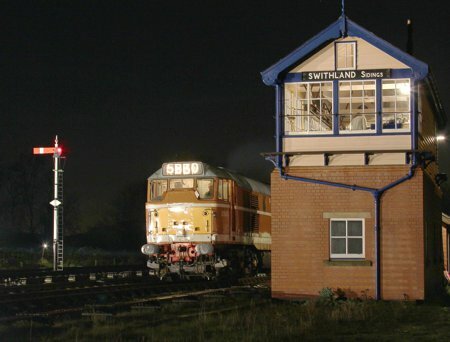 Join us for an evening train with both steam and diesel haulage to see in the New Year. Departing Loughborough Central at 19:00, enjoy an evening travelling through the night and into 2019. On the final trip of the evening, we will arrive at Leicester North station at approximately 23:50. Here we will pause the celebrate the arrival of the New Year at midnight before departure again at 00:15. Class 31 D5830 will be providing the traction at the Leicester end of the train with 70013 "Oliver Cromwell" (appearing courtesy of the National Railway Museum) due to be at the Loughborough end. Our Griddle Car will be open for business throughout the evening with a fully stocked bar as well as a New Year’s Eve meal options. All priced at £5, and served with chips and mushy peas. Advance bookings for food have now closed, but orders can be taken onboard subject to availability. The Night Rider service departs from Loughborough Central at 19:00, 20:25, 21:55, and 23:30. The full timetable is available for download by clicking the button below. Ordinary tickets purchased for 31st December 2018 are valid on this train. Tickets can be booked online how here.